Tomorrow brings new challenges. Where companies need to be even more efficient and timely. We are dedicated to develop Lead Logistics solutions that suit you today. And tomorrow. Lead Logistics provided by Schenker Dedicated Services. Being an experienced Lead Logistics provider and by using state of the art optimising tools, our professional Supply Chain engineers will bring you customised and competitive transport and logistics solutions for your complete Supply Chain. We are an independent 4PL operator dedicated to you, who can source freely on the market for the most suitable supplier on each occassion. With access to hundreds of transport providers we can achieve very competitive transport solutions. 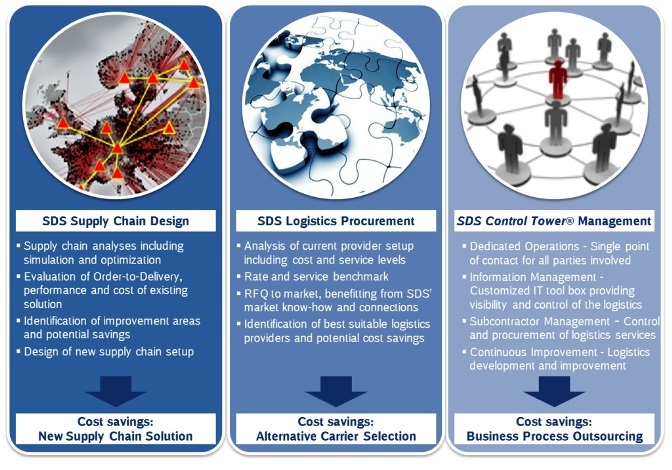 The SDS Control Tower can be considered as your single point of contact, which coordinates all activities in your Supply Chain, both commercially and practically on all levels: strategical, tactical and operational. Are you looking for optimising Freight Management or more interested in an overall 4PL approach? Are you a supplier that wants to grow with us? Read more here.